The reflection/sermon below by author Albert Butzer III on John 13:1-17 rings true to me. 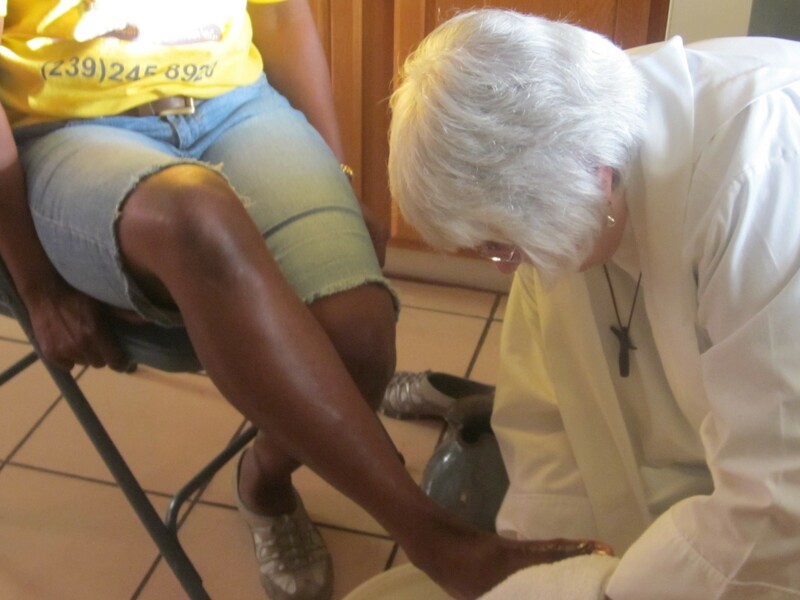 I remember declining a foot washing opportunity when asked by my much loved and revered people’s priest and mentor in Hartford, Connecticut, Fr. Al Jaenicke. I am not sure of all my reasons but I would give anything if I could turn back the clock and accept that most generous offer. Fr. Al went home to his loving God a few years ago. He is with the great cloud of witnesses and communion of Saints that continue to lead me on. Yet, I am not good on receiving. I think I am better at giving. Jesus was good at both. Remember how he accepted having his feet anointed with expensive oil by Mary,Martha’s sister who also wiped them dry with her hair? (John 12:1-7). Although he explained her anointing as burial preparation, he was also moved by the love of Mary and Martha and Lazarus, whom he raised from the dead. He loved them. We remember that the best way to love Jesus is to love one another-indeed to give and receive love is to follow Jesus. My own ministry with the homeless here in Fort Myers began in the park in 2007 with washing the feet of a homeless man with diabetes whose feet were painfully swollen and ulcerated, That dear man is now thankfully housed and is still active with our ministry. And, indeed, he brings regular offerings that we graciously accept. He also serves his neighbors in many other ways. Tomorrow evening we will wash each other’s feet at our church and all feet will be washed, including mine. Then we will share Jesus’ last supper with his disciples which represents the ultimate level of giving one’s self for one’s friends. Thank you Jesus for showing us the way. And thanks to Albert Butzer III for this timely reflection. According to the Apostle Paul, Jesus once said, “It is more blessed to give than to receive” (Acts 20:35). Not surprisingly, all across the years the Church has agreed! What is the weekly offering but an opportunity for people to give rather than to receive? What are annual stewardship drives and special offerings like One Great Hour Of Sharing but opportunities to give rather than to receive? What are invitations to sing in the choir, teach in the Sunday school, volunteer at the soup kitchen, and go off on mission trips to far–away places like Mexico but opportunities to give rather than to receive? “It is more blessed to give than to receive,” said Jesus, and all across the years the Church has nodded in agreement. Clearly, the reading from the thirteenth chapter of John contains a strong emphasis on giving. Jesus gets up from the table, takes off his outer robe, grabs a towel and a basin of water, and begins to wash the disciples’ feet. A moment later he says to them, “If I, your Lord and Teacher, have washed your feet, you also ought to wash one another’s feet. For I have set you an example, that you also should do as I have done to you” (John 13:14–15). So we Christians understand ourselves to be a servant people, following the example of our Teacher and Lord. Robert Holland, a Presbyterian minister before he died, spent his summer vacations at the Chautauqua Institute in New York State. One summer he had a neighbor who was a sculptor. “I’ve been thinking of sculpting you a figure of Jesus,” said the neighbor. “What do you think his most characteristic pose would be?” Holland thought long and hard about the question. What is the most characteristic pose of Jesus Christ? Is it theteaching Christ sitting on the slope of Mount Beatitude, the healing Christ reaching out to touch someone in need, the crucified Christ nailed to the cross of Calvary, or, maybe, the resurrected Christ standing in front of the empty tomb? Finally Holland replied, “I know what I’d like. I’d like you to carve me a statue of Christ with the towel washing the disciples’ feet. That’s the Christ I want the world to know – the serving Christ, the one who gives of himself for others.”1 “It is more blessed to give than to receive.” Don’t you agree? Occasionally, however, we Christians discover that receiving is just as important as giving. Yet, for many of us, receiving is much more difficult. Consider, for example, Peter Gomes, the minister to Harvard University. Early in his career while teaching at Tuskegee Institute in Alabama, he received invitations to preach from the pulpits of small, rural, black Baptist churches in Macon County. These little churches paid the visiting preacher by taking up a “love offering” immediately following the sermon, which, according to Gomes, became “something of a referendum on preacher and sermon alike”! “Early on,” he writes, “I refused these offerings on the grounds that these poor people and their poor church needed the money more than I did, since I had a decent salary from the institute, after all, and it was my pleasure to give.” But when Gomes mentioned his refusals to the dean of women at Tuskegee, she thundered, “Who are you to refuse to accept the gift of these humble people? You have given insult by refusing to let them do what they can for you.”2 Sometimes, you see, it is more difficult to receive than to give. Most every congregation has a handful of saints like the woman about whom I’m thinking: Active in church all her life, she was one of the most tireless and selfless members of the congregation. While many of the members drove late–model luxury cars, she zoomed around town in a nine–year–old Honda Civic. Her wardrobe was similarly out of date. But with a shrug of the shoulder she’d say, “I can think of more important things on which to spend my money.” When a couple would arrive home from the hospital with a brand new baby, she’d be the first to drop by with a casserole, a plate of cookies, and a word of advice to the nervous parents about how to change a diaper or give the baby a bath. When the church needed someone to organize a potluck supper, fold the Sunday bulletins, or even tackle the troublesome junior high Sunday school class, she – God bless her! – would be the first to volunteer. But then, tragically, she suffered a stroke, which left her partially paralyzed. Other church members tried to offer to help her, but she refused, fiercely independent soul that she was. “Thank you, dear,” she would say, “but I can get by just fine by myself.” Finally, in exasperation one of the deacons said, “She has been a care–giver all her life. But now she needs to learn how to receive help as well as give it.” For her, and for many of us, it is more difficult to receive than to give. So it was for Simon Peter, and, perhaps, for the other disciples as well. For when Jesus takes a towel and a basin of water, Peter protests. “Lord, are you going to wash my feet? You will never wash my feet” (John 13:6, 8). I have a book on my study shelf that is filled with famous paintings of biblical scenes. The book includes a thirteenth century work by an unknown French artist that shows Jesus washing Peter’s feet while the other disciples watch and reluctantly wait their turn. The two disciples to Peter’s left, knowing they are next in line, are nervously brushing the dirt from their own feet before Jesus gets to them.3 How strange, but how characteristic of human nature! No where is this grace of God and the Lord Jesus Christ more tangible than in the Upper Room on the night of Jesus’ betrayal. For during supper, Jesus got up from the table and laid down his robe, which in the opinion of eminent New Testament scholar Raymond Brown is a symbol of the way Jesus will soon lay down his life on the cross,6 and he began to wash the disciples’ feet. 1. Robert Cleveland Holland, Robert Holland At Shadyside (Pittsburgh: published by Shadyside Presbyterian Church, 1985), pp. 22–23. 2. Peter J. Gomes, The Good Book: Reading The Bible With Heart And Mind (New York: William Morrow and Company, Inc., 1996), pp. 310–311. 3. Richard Muhlberger, ed., The Bible In Art: The New Testament (New York: Portland House, Publishers, 1990), pp. 110–111. 5. Frederick Buechner, The Longing For Home (San Francisco: Harper Collins Publishers, Inc., 1996), p. 175. 6. Raymond E. Brown, The Gospel According To John (xiii–xxi) in the Anchor Bible Series, (Garden City, New York: Doubleday & Company, Inc., 1970), p. 551.